This photograph depicts a close-up of Eocene limestones from the Sardinero Formation in Cantabria (Northern Spain). 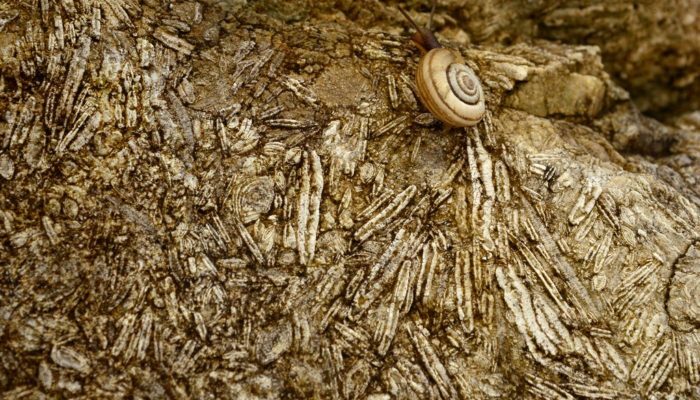 The limestone is rich with foraminifera shells, most of them from the Nummulitidae family. These organisms once lived in a very shallow sea that separated Europe from Iberia in the late Mesozoic and early Cenozoic era. Later the sea basin’s closure led to the formation of the Pyrenees. The remarkable abundance of these Paleogene and Eocene fossils around the globe led Eugène Renevier, a Swiss geologist from the 19th century, to propose merging the two Epochs into the Nummulitic Period, a suggestion that did not succeed. One of the marvellous things I saw at the pyramids should not be omitted: there are heaps of stone-chips lying in front of the pyramids; and among these are found chips that are like lentils both in form and size; and under some of the heaps lie winnowings, as it were, as of half-peeled grains. They say that what was left of the food of the workmen has petrified; and this is not improbable. Indeed, in my home-country, in a plain, there is a long hill which is full of lentil-shaped pebbles of porous stone; and the pebbles both of the seas and of the rivers present about the same puzzling question; but while these latter find an explanation in the motion caused by the current of water, the speculation in that other case is more puzzling. It has been stated elsewhere that in the neighbourhood of the quarry of the stones from which the pyramids are built, which is called “Trojan”, and that there are caves at the foot of it, and a village near both these and the river which is called Troy, being an ancient settlement of the captive Trojans who accompanied Meneläus but stayed there. Despite this initial description referring to lentil-sized Nummulitidae, the size of these fossils varies considerably among different species, and can reach up to 12 cm, some of which have been found in Cenozoic rocks in the same area where the photograph was taken. Such a size is remarkable, considering the fact that Nummulitidae are unicellular organisms. There are lots of genera within the Nummulitidae family, the most common of which are Assilina and Nummulites. The fossils in the photograph are about 1 cm in length and pertain to the Nummulites genus. Nonetheless, more elongated and white fossils from the Discocyclinidae family are also present in the limestone; one of them can be found right below the crawling snail. While taking some pictures of the outcrop, I noticed the snail in the lower part of the frame, slowly crawling towards the top of it. To my surprise, it chose to follow the path drawn by two large Discocyclinidae shells, and I rushed to take this photograph. Two living beings together but separated by 50 million years, embodying a sort of spacetime paradox.